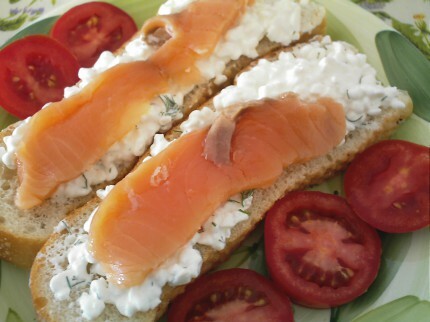 This is a quick and easy smoked salmon sandwich recipe, perfect for a tasty and healthy snack. Cut the French baguette in two even slices. Mix the cottage cheese with the minced dill, then spread it on the bread. Add the salmon slices on top, then put the sandwiches on a plate with the sliced tomatoes aside.